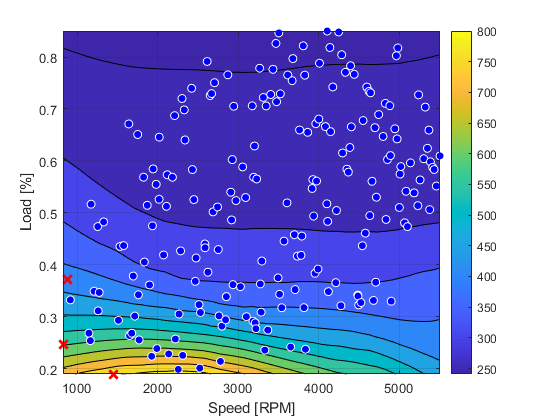 This example shows how to use Curve Fitting Toolbox™ to fit a response surface to some automotive data to investigate fuel efficiency. 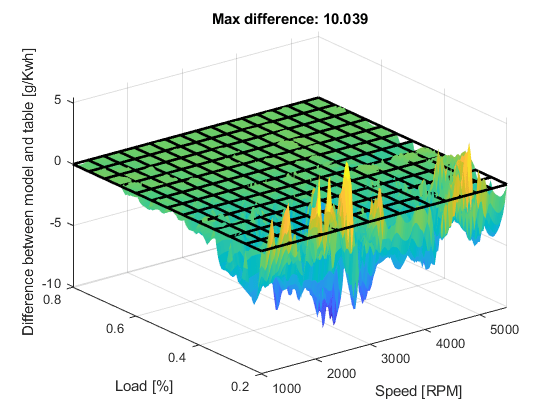 The toolbox provides sample data generated from a GTPOWER predictive combustion engine model. The model emulates a naturally aspirated spark-ignition, 2-liter, inline 4-cylinder engine. 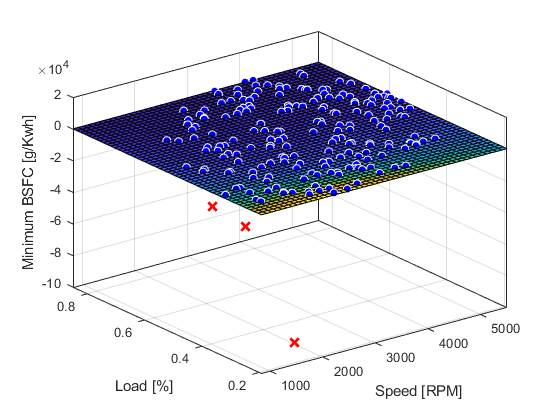 You can fit smooth lowess surfaces to this data to find minimum fuel consumption. Speed is in revolutions per minute (rpm) units. Load is the normalized cylinder air mass (the ratio of cylinder aircharge to maximum naturally aspirated cylinder aircharge at standard temperature and pressure). BSFC is the brake-specific fuel consumption in g/KWh. That is, the energy flow in, divided by mechanical power out (fuel efficiency). 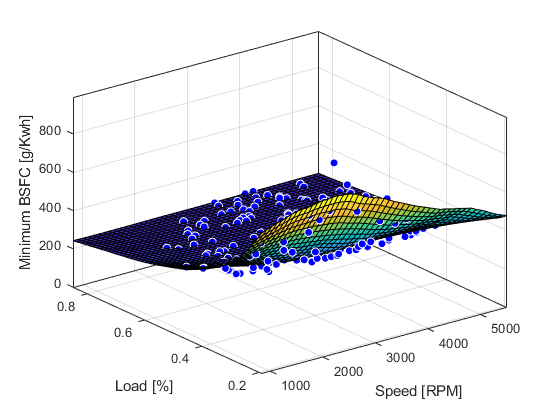 The aim is to model a response surface to find the minimum BSFC as a function of speed and load. You can use this surface as a table, included as part of a hybrid vehicle optimization algorithm combining the use of a motor and your engine. To operate the engine as fuel efficiently as possible, the table must operate the engine near the bottom of the BSFC bowl. Load the data from the XLS spreadsheet. Use the 'basic' command option for non-Windows® platforms. Create a variable n that has all the numeric data in one array. Extract from the variable n the columns of interest. Process the data before fitting, to pick out the minimum BSFC values from each sweep. The data points are organized in sweeps on speed/load. For each speed/load site, find the data at the site and extract the actual measured load and the minimum BSFC. 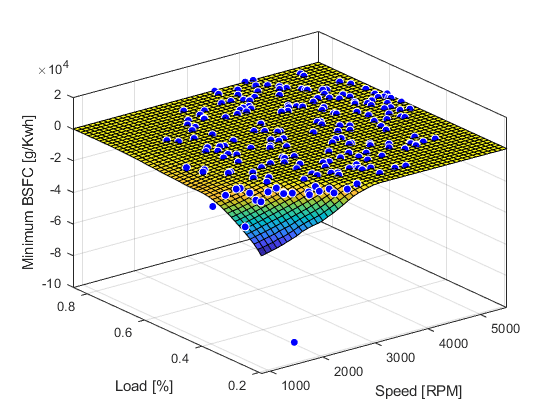 Fit a surface of fuel efficiency to the preprocessed data. There are points where BSFC is negative because this data is generated by an engine simulation. Remove those problem data points by keeping points in the range [0, Inf]. Plot the new fit. Note that the excluded points are plotted as red crosses. Zoom in on the part of the z-axis of interest. 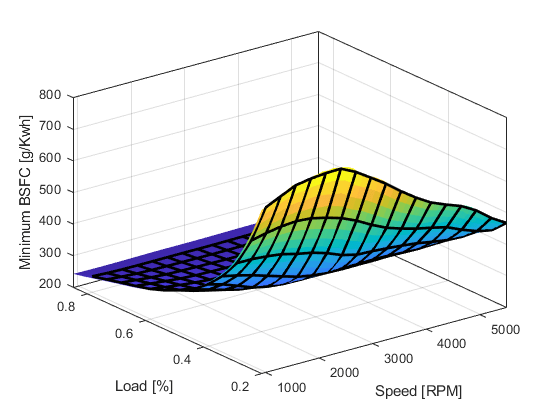 You want to operate the engine efficiently, so create a contour plot to see the region where the BSFC is low. Use the plot function, and specify the name/value parameter pair 'style','Contour'. Generate a table by evaluating the model f2 over a grid of points. Create variables for the table breakpoints. To generate values for the table, evaluate the model over a grid of points. Examine the rows and columns of the table at the command line. The grid on the model surface shows the table breakpoints. View the difference between the model and the table by plotting the difference between them on a finer grid. 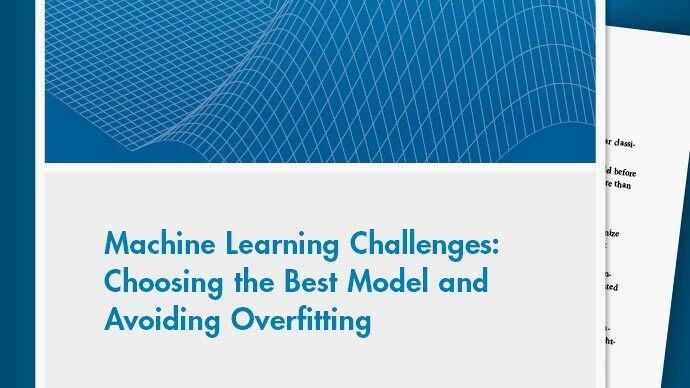 Then, use this difference in prediction accuracy between the table and the model to determine the most efficient table size for your accuracy requirements. The following code evaluates the model over a finer grid and plots the difference between the model and the table. You can use the xlswrite function to export your table data to a new Excel Spreadsheet. Execute the following command to create a spreadsheet file. If you have Simulink™ software, you can create a Look Up Table block as follows. Execute the following code to try it out. 1. Create a model with a 2-D Lookup Table block. 2. Populate the Lookup Table with speed breakpoints, load breakpoints, and a lookup table. 3. Examine the populated Lookup Table block.